[box]Kay Goldstein has enjoyed a multifaceted career that includes professional work as a psychotherapist, chef/entrepreneur, author, poet and meditation teacher. She is married and has two grown children. Kay enjoys a variety of leisure activities that include photography, kayaking, gardening, cooking and theater. 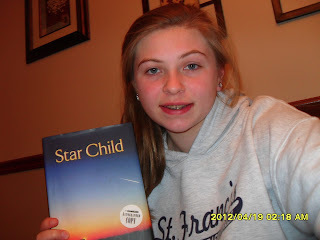 Star Child, published in 2012 is her second book and first fiction story. Shannon Smith: Hello my name is Shannon Smith from Boston,Massachusetts. I am here to ask you about your wonderful and inspiring mentoring book, Star Child. Questions like: why you wrote it, what is love. This book is a really wonderful and inspiring book. It made me feel like everyone is special in their own way. I really want to know, what message do you want people to get from this book? Kay Goldstein: I loved getting your request and hearing how much you felt inspired by Star Child. You obviously got the main point, which is that everyone is special in their own way and that our purpose is to find our true selves and express those gifts. I wrote the book because I was inspired by the characters who sort of arrived in my imagination in moment of inspiration- and totally unexpectedly. I then found that I loved the images of world that was flowing onto the page. I liked being in my own imagination and was constantly surprised by what happened. I also thought it was a great way to think about important questions about life and reflect some of the things I had been learning. But mostly I wrote it because I loved doing that. What is love? I don’t think I have all the words necessary to describe it. Love is bigger than all the words put together. It is the driving energy /force of the universe. Love is most powerful when allowed to flow freely from our hearts. It then connects to everything and everyone. This book was based on love, compassion and soul mates do you personally have an experience like this? I am fortunate to have many experiences of feeling unconditional love and acceptance and compassion. Many people have shown me how to find this: some were formal teachers, others were family members, others were friends or even strangers. I think that the most important thing is that we learn to feel unconditional love and compassion for ourselves. About soulmates: Terra and Marius were obviously very powerfully connected from the beginning. But what the story shows is that they learn to be fully themselves before they can freely offer themselves in relationship to the other. Every relationship has the potential to teach us new things about ourselves and can therefore have meaning. Sometimes relationships feel very negative and we can learn something from that too. One of my wise teachers once said, “a Soul does not need a mate.” I think that may be true, but I also believe that some relationships help bring us closer to our true self than others. The closer we are to living as our best self, the more likely we are to find others to support that journey. As for my personal journey, I have been married for 42 years. I can’t honestly say that my husband is or is not my soulmate. But I know that I am constantly learning something from this relationship and that it continues to grow in a loving way. I feel clearly that our relationship was meant to be. The girl “Terra” in this book takes care of and helps a couple. How did you come up with this? Terra’s relationship with the old couple reminds me of times when I grew up in my grandfather’s house. I used to help him in his workshop and I loved sewing and being useful. I did not purposely try to incorporate this into the story, but it was easy to draw on my own experience and sweet to remember how much I liked doing those things. I have also been a caretaker of others as they aged. What inspired/drove you to become an author and your other occupations? That is a good question. There are times I wondered myself. Since I have had many careers and jobs, one would have to wonder why I kept changing and evolving. Each time I made a change in my work, it was because something really drew me to it. When I stopped practicing as a psychotherapist and became a full time cook and food entrepreneur, it was because I loved doing it and found a way to really express my creativity. But I used the skills I had learned previously to help manage employees and the stresses of running a business. Later I sold my business when I had small children and found it impossible to do both without burning out. Each time I thought I was changing my self image and public identity along with my career. But something about me and how I look at and interact with the world never really changed. Looking back, I see now how everything I have done has led me to this particular juncture in my life: writing and talking about the challenges and meaning of life here on Earth. Why did you pick these characters to take place in this book? I think the characters picked me 😉 Some were drawn from my life experience, but sometimes they just appeared on the page when I was writing. It can happen when we let go and just let our imaginations take over. Do you want this book to help other children’s lives? What do you mostly want them to get from reading this book? I do hope that young people find comfort and inspiration from this book and can use it as a kind of roadmap to remind them of ways to travel on their life journey. I think though that that only thing I really know about this book right now is the joy and love I felt in writing it. I hope all my readers experience some of that. Thank you for taking the time to answer my questions about your inspiring book, Star Child. Are you inspired by an author, a teacher, a friend? Tell us how they mentored you! Please SHARE your mentoring stories with Over My Shoulder Foundation, consider donating to our non-profit and don’t forget to follow Over My Shoulder Foundation on Facebook too, especially this January during National Mentoring Month.